Brady Industries is the premier cleaning solutions provider throughout the Western United States. We provide cleaning solutions to our customers while exceeding their expectations with quality, service, and integrity. Some intrepid Second Amendment warrior did not place Brady mats into the urinals as an act of political theater. The Brady with arrow symbol is a tradmark of Brady Industries. In the days of Michael Bloomberg and other billionairs working hard to disarm Americans, a Bloomberg mat would have been more appropriate. Before the Brady Campaign to Prevent Gun Violence, the organization went through a number of name changes. It started as the National Council to Control Handguns, in 1974. In 1980, the name was changed to Handgun Control incorporated. That name lasted until 2000, when the name was changed to The Brady Campaign to Prevent Gun Violence. You can see how the focus shifted from handguns to the latest term, "gun violence". Gun violence is used as an Orwellian term to include suicides. As homicide rates dropped while the number of firearms per capita in the U.S.A. rose, it became harder and harder to sell "gun control" as a crime fighting measure. The Brady Center to Prevent Gun Violence expressed strong support for the importance of allowing local cities and communities to promote public safety and protect against gun violence. The terms "Handgun Control" and "Gun Control" have lost appeal to the American electorate. The current tested meme is "Gun Safety". Who can be against "Gun Safety"? There are plenty of Second Amendment supporters attending the Shot Show who remember when the Brady Campaign to Prevent Gun Violence was the major player in opposition to Second Amendment rights. None of them engaged in a low level political prank of putting an opposition organization name in the public urinals. It is simply a coincidence of our industrialized society. 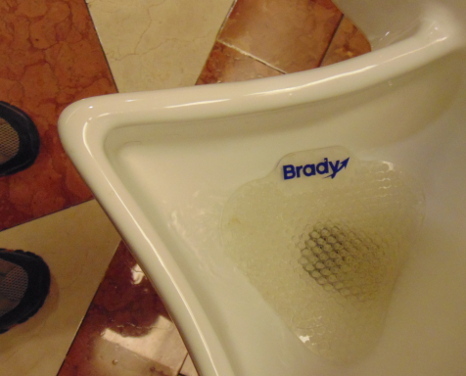 Still, many of them are smiling when they see the Brady name in the urinal mats in front of them. If you had any doubts about the elevated place of the Media in today's society, consider if anyone without a press pass had started taking pictures of urinals in public bathrooms at a highly attended event such as the Shot Show. As a highly respected member of the gun media, no one blinked when I did it. That's right, we just piss all over gun control lol.